The Martian South Pole. 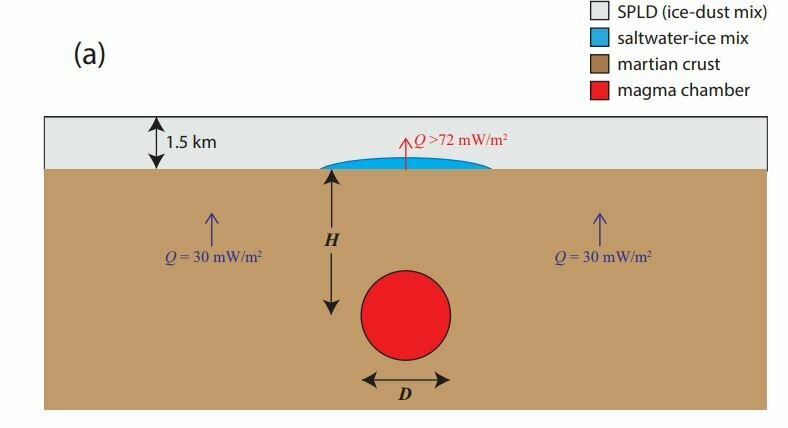 A new study in Geophysical Research Letters argues there needs to be an underground source of heat for liquid water to exist underneath the polar ice cap. Credit: NASA. The new research does not take sides as to whether the liquid water exists. Instead, the authors suggest recent magmatic activity—the formation of a magma chamber within the past few hundred thousand years—must have occurred underneath the surface of Mars for there to be enough heat to produce liquid water underneath the kilometer-and-a-half thick ice cap. 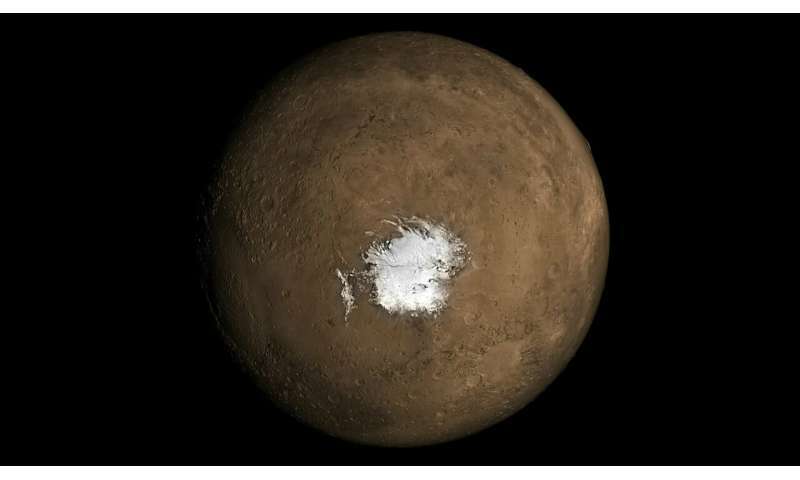 On the flip side, the study's authors argue that if there was not recent magmatic activity underneath the surface of Mars, then there is not likely liquid water underneath the ice cap. Schematic of the case considered in the new study causing a local elevated heat flux beneath Mars’s south polar ice cap. The schematic shows a magma chamber of diameter D buried at a depth of H (to the center of the chamber) beneath the putative liquid water, creating an elevated heat flux Q as it cools. Credit: AGU/GRL/Sori and Bramson. The idea of volcanic activity on Mars is not new—there is a lot of evidence of volcanism on the planet's surface. But most of the volcanic features on Mars are from millions of years ago, leading scientists to believe volcanic activity below and above the planet's surface stopped long ago.